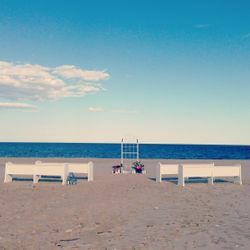 We all know that May can be a little iffy when it comes to "wedding weather" but Saturday, May 3rd, couldn't have been a more perfect day for a Spring wedding at the beach. This date also marked Rustic Drift's first two weddings ever. What better way to kick off our very first year in business than a double-header. One of our couples, Erica and Jon picked Brant Beach Yacht Club as their bayside venue. Our rental items for this wedding included our Schwinn Twinn Bicycle and our 1940 Navy Blue Cadillac. 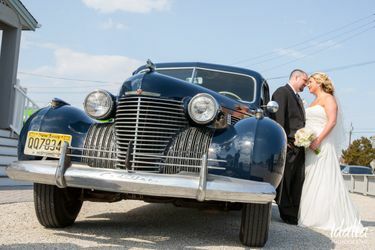 What says a LBI wedding better than a beach cruiser and a classic car with nautical colors? Yes, that's right.. nothing. I remember the first time I asked Joel to go to church with me and his response was, "the ocean is my church." While I rolled my eyes at this witty remark from this avid surfer, this response has grown on me since. I am not one to push you out of bed on a Sunday morning to get to mass, or judge you when you don't attend church not even on Christmas Eve and I do not care about your beliefs but I do think it is important to believe. For Joel, being out on the ocean on a surfboard provides him time to think, relax and reflect. The same as some of us may do while taking a walk, going for a run, casting a line or maybe even going to church. While penciling ideas for Rustic Drift about a year ago, when we were working on fine tuning potential rental items for ceremonies, I brought up church pews. Although this idea seemed slightly bogus to my husband at first, Joel was much more receptive than I had anticipated. When we came across the opportunity to purchases old pews from a church down in Mays Landing, we jumped right on it. The logistics of refinishing ten church pews and transporting them to the beach for a wedding is no easy task but one that we both find rewarding in this business. For me, church pews on a beach symbolize faith while the ocean symbolizes opportunity. And what could be more truthful for a wedding day. We have to remember as well that marriage is about compromise. If I can't get Joel to always go to my church at least I can now bring my church to him and vice versa. There seems to be a pattern going on here. The snow is always chasing us and we're always racing against the clock. But what does that matter. When you're able to snap amazing photos like Ann Coen under the constraints of time, weather and God knows what else everything else falls to the wayside. On another snowy January day we were able to squeeze in a styled shoot with School of Vintage, Ann Coen Photography and MDS Floral Designs right as the first snowflakes started falling from the sky. 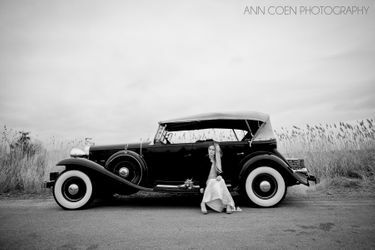 Our 1932 Cadillac and wine barrels made their modeling debuts at this shoot. I couldn't be happier with the results. Big things ahead for the little LBI wedding power team we're forming. On December 7th we had the awesome opportunity to host our very own VIP Launch Party @ Black-Eyed Susans in Harvey Cedars, NJ. Our good friends and co-owners Ashley Pellegrino and Chris Sanchez were kind enough to open their doors in the off-season to help host our event. We invited local wedding professionals, vendors and venues to attend our launch party, snack on some delicious hors d'oeuvres, drink some craft beers, listening to the acoustic rhythms of local musician, Ryan Zimmerman and take a gander at the rental items we would be offering for the 2014 season. Some items we featured included our 10’ and 5’ farm tables, mismatched china, wine barrel high tops, wine barrel cooler, reclaimed lumber bar cart, ice cream cart and both our Edison and lantern string lights. We packed the house and received amazing feedback and recognition from the peers among us in the industry. We couldn’t be happier with the turn out, not to mention the wonderful write up we received from the Sandpaper. As we broke down the event the next day we were hit with the very first (of what seems like 200+) snowstorm of the season. Moving everything in a couple inches of powder was no easy feat but after the night before nothing could break our spirit. We want to thank all of our attendees. The support from the LBI community, our family and friends has been commendable beyond our belief.